I have now been to the 2016 orchid show. I have good news and bad news. The good news is that I enjoyed myself more than I usually do. We've been attending the shows long enough (since 2010) that I know more or less how to get in, get the photos, and get back out again with minimal trouble. Nobody from the Illowa Orchid Society ambushed me to chastise me for my complaints about the tags on the plants, and there were, as usual, a few plants that really impressed me. Maybe even more than usual. The bad news is that it was overcast all day,1 so the light was less than ideal for photos, and as a result, the photo quality suffered. I haven't edited any of the photos yet, so it's possible that I'll still be able to turn them into decent shots, but the initial impression after uploading them was pretty bad. My point being, don't get your hopes up for the next year of orchid photos. Some of them still turned out fine, but I expect the overall quality is going to be lower than those from the 2015 show. Nothing I could do about it: I don't control the weather.3 Sorry. I still have to get the photos edited and uploaded, names checked, posts scheduled, ancestries checked out, notes made, and previous appearances looked up: I hope that will be finished by the time you see this, but I kind of doubt it. Meanwhile, we do still have an orchid from 2015 to look at. I don't remember it being this dark of a yellow in person, say my notes from five days after the 2015 show. I could only find a couple other photos of it on-line, and they both indicate a lighter, less orangey yellow. (Only one photo is linkable, alas.) This is probably a photo-editing failure: the background looks a little redder than it ought to as well. I'm impressed with these flowers to the degree that they're both an unusual color and an unusual pattern, but even at the show, I was kind of ennh about this one. 1 On the way there, we occasionally saw some light sprinkles of rain or snow, but nothing too serious, and then out of nowhere there was this amazing patch of incredibly dense, wet, clumpy snow. The snow didn't accumulate; it was too warm for that. But there was enough snow in the air to limit visibility substantially, and it was bizarre and amazing. And then after about 3 minutes, it stopped entirely, and it was just a normal overcast spring day again. March! 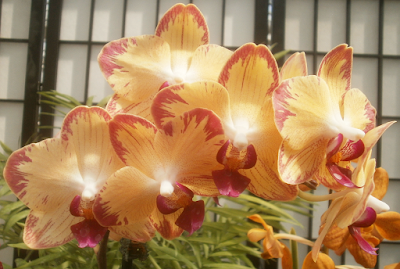 Thank you for telling me the name of this lovely orchid. I have an orchid that looks a just like this. The thing about it that intrigues me is, when the buds first open the colors are quite bright. Then after about a week the blossoms start to mellow going from a true yellow to more of a buttery yellow. So, at times, there were different hues on the plant. I bought it at ePlant World on Highway 92 in San Mateo county, Calif. There is no id tag, as this is kind of a wholesale to the public warehouse aimed at the budget minded more than the fancier. Well, I agree about the no ID. As I said, the new owners of this warehouse don't supply IDs, just interesting plants at very low prices. I wrote mainly to bring up the color variation in the blossoms as they age -- as you had mentioned about not remembering it being such an intense yellow. It occurred to me that if your eye happened to be more focused on the older blossoms, you may remember the color as being pale. Where as the camera sees the image more objectively. When we bought this plant, all the open blossoms were butter colored. New blossoms were bright yellow, but quickly paled. Interesting, I think. Anyway, I appreciated seeing your picture and reading your posting.